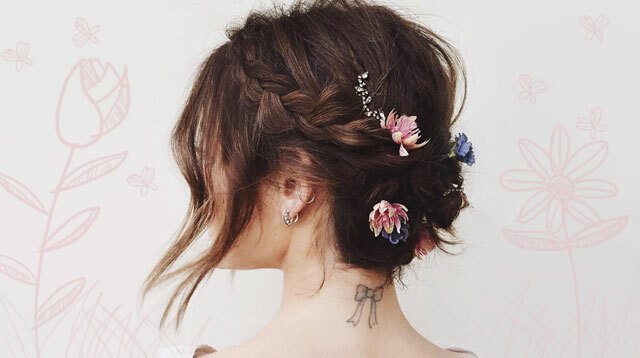 Whether you're the bride or a bridesmaid, these updos can do no wrong! The brunette girl in the photo is actually actress Lucy Hale, who wears a chin-length bob IRL. But her hairstylist Kristin Ess managed to bring her short locks up to this gorgeous center-part Dutch braid updo. Don’t forget to loosen—or pancake—the braids to make the locks look fuller! For a simple but very elegant braided updo, take cues from Yassi Pressman and wear the rest of your locks in a sleek and low ponytail. Okay, this totally says “WEDDING!! !” Ask your hairstylist to add in some colorful fresh flowers—or little sparkly trinkets—into your updo, and you’ll be turning heads all day.